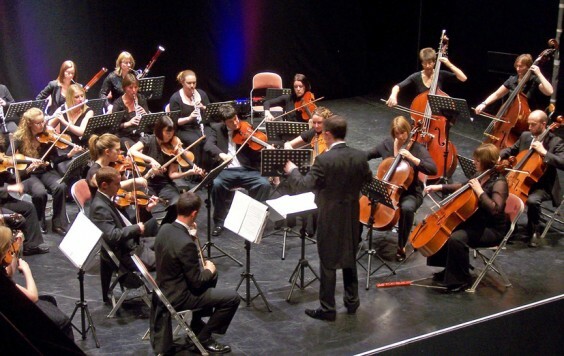 The Midland Sinfonia urges music-lovers to support the orchestra. The Midland Sinfonia was formed in 1995 by Nigel Morley to bring professional classical music to the people of the Midlands and elsewhere. Based at St Laurence Church, Alvechurch, it has established a reputation for its performances of classical music to a very high standard. Under Nigel’s leadership the orchestra played in France and Jersey, as well as at venues closer to home in Bromsgrove, Evesham, Redditch and Ludlow. For many years Nigel managed all aspects of the orchestra, administrative as well as musical. In 2001 The Midland Sinfonia became a registered charity with an elected board of directors to take over the administration, leaving Nigel free to concentrate on musical matters. The board was able to invite sponsors and patrons to support the orchestra financially and has been very grateful for the income that it has received from these sources, as well as a generous annual donation from The Elmley Foundation. Julie Kirkbride MP accepted an invitation to become president of the orchestra. Richard Laing, who had played violin in The Midland Sinfonia from time to time, was appointed Assistant Music Director in 2006 and became Music Director and principal conductor this season, following Nigel’s move to Lincolnshire two years ago. Richard won the sinfonia VIVA Conducting Scholarship in 2001 and is in demand across Britain and Europe. The Midland Sinfonia is fortunate to have his inspiring musical leadership and enthusiasm at its service. He is ambitious for the future of the orchestra and would like it to be better known and play at more venues in the Midlands. However, reduced audience numbers in Alvechurch and Bromsgrove and the current financial climate mean that the future existence of The Midland Sinfonia is uncertain. This Season the Board is trying Sunday afternoon concerts at the Artrix in Bromsgrove to attract a different audience, while hoping that the regular supporters in Alvechurch will also attend. Even though running costs have substantially increased the ticket prices have been held. Unless audience numbers increase considerably, the 2008/9 season of The Midland Sinfonia, sadly, will be its last. Our next concert is on Sunday February 15 at 3pm at Artrix, Bromsgrove, conducted by Richard Laing with guest violinist Simon Chalk. The concert is entitled The Romance of Music and features pieces by Mozart, Beethoven, Haydn, Schubert and Richard joining Simon Chalk for Bach’s Concerto for Two Violins. So, please, if you want The Midland Sinfonia to continue, come along and bring as many relatives and friends as you can.